As soon as Brayden was born I knew that something was just not right with his eyes and eyesight, but it took seven months to get a diagnosis. The word CANCER was a big shock, but we had no time to waste. We were here in Memphis within 24 hours. Getting to Memphis and the hospital was scary at first – a new city, a new place, lots of unknowns – but once we were moved to Ronald McDonald House® we knew we had found a place we can call home while we’re battling against cancer. Both of our boys have played here, lived here, laughed here for the past 9 months. Before Ronald McDonald House®, we felt isolated, like in a foreign place, but once we got here we found a community. There are so many places for families, for kids to get together and talk, play, socialize, find support. The families gather at dinner time and we share our days, we play board games at night and watch our children forget about the hospital, the treatments and become just kids again. We’ve made so many friends and they have become family to us now. If you ask my three-year-old son, Peyton where he lives, he’ll tell everybody it’s “the Ronald House in Memphis." And Brayden grew up here, he was just 7 months when we arrived and this house holds most of the memories he’s made. 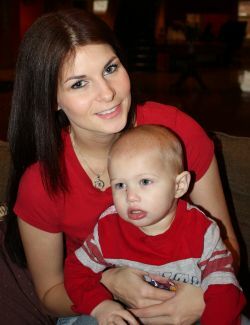 As a mother Ronald McDonald House® means everything to me. The comfort, the safety, knowing my sons are okay, that we are not alone. That’s probably most important to me, the knowledge that we are not going through this alone. This house makes me feel like my children are not spending a year in a hospital. Instead they get to spend time in this most amazing place. My children’s happiness is based on what surrounds them, and at Ronald McDonald House® of Memphis it’s love, hope, kindness, friendship, comfort and compassion that surrounds us all.